Acidanthera bicolor calls for attention in the garden with its two toned fragrant flowers. The Peacock Orchid is sometimes called the Fragrant Gladiolus. Acidanthera bicolor is not an orchid at all, and is closely allied with the Gladiolus group. Acidanthera bicolor requires decent drainage. The Peacock Orchid will grow two to three feet tall, as the plants tend to flop, some support helps. I like mixing bulbs with low groundcovers or shrubery to help keep the stalks from tipping. 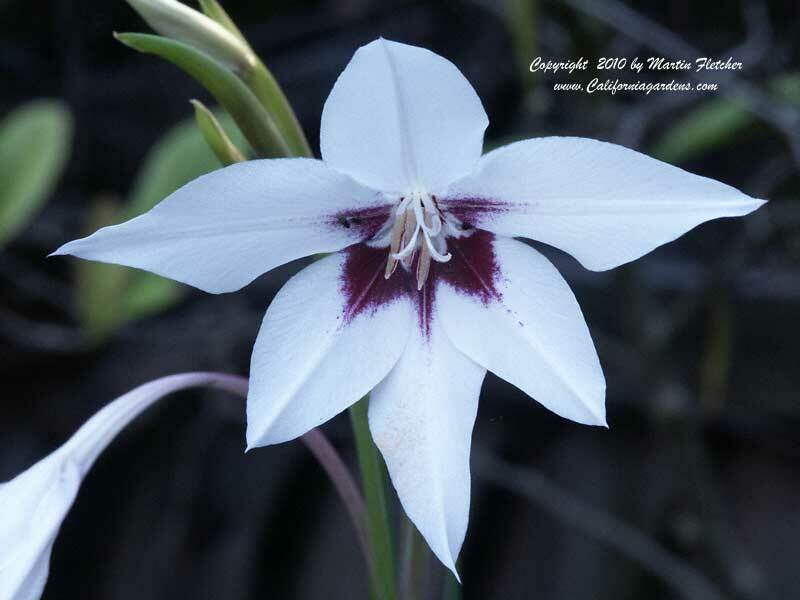 The bulbs of Acidanthera bicolor are frost tender and should be taken up if Winter temperatures are likely to dip below 25° F. Acidanthera bicolor has undergone a name change, while it is still often sold under this name, Gladiolus murielae is the new name this plant is increasingly sold under. Flowers of Acidanthera bicolor the Peacock Orchid, or Fragrant Gladiolus. High resolution photos are part of our garden image collection.